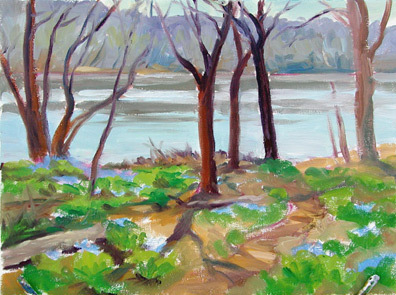 Landscape Oil Painting Demo - "Virginia Bluebells"
CHRISTINE LASHLEY — ARTIST’S STATEMENT: As a contemporary impressionist painter, I am constantly drawn to light. Nature’s unique colors, harmonies and contrasts offer a visual feast that I love to capture in artwork. I gather most of my ideas by painting outdoors. On location there is no time to second-guess choices, so the resulting brush strokes convey a sense of immediacy and vitality. My studio paintings are a chance to work larger, while retaining the freshness of painting “plein-air”. Planning first, with sketches and reference, lets me paint freely in the final artwork. Favorite subjects are portraits, still life and landscapes. ARTIST’S BIO: Christine Lashley studied as a teen in Paris at the Parsons Art Institute and the Sorbonne, continuing on to earn her Bachelor of Fine Arts at Washington University in St. Louis. She worked for several years in the fashion industry in Europe, then as a muralist and graphic designer, but turned her interest to fine art soon thereafter. 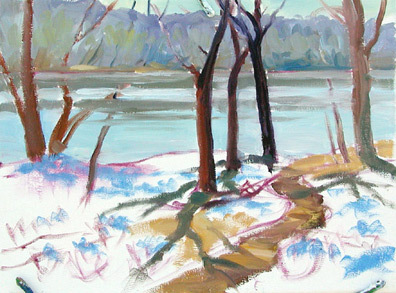 Christine’s paintings have been shown nationally and internationally. With numerous works in private and corporate collections, her work has also been featured in publications such as:American Artist Magazine, The Washington Post, and Elan Magazine. 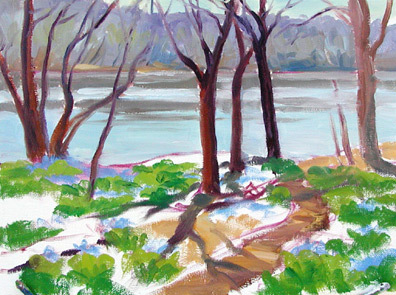 A North Light Publications book: Creative Freedom, will feature two of her oils in a step-by-step demonstration. 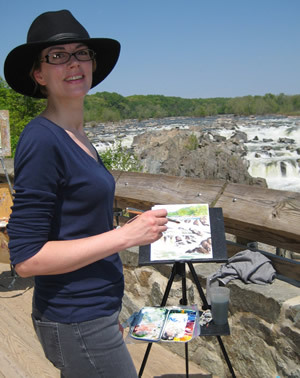 Christine currently lives in the Washington DC area with her husband and two children, and has been an art instructor for over 10 years. She is a juried, signature member of several art groups including: the Potomac Valley Watercolorists (where she served as President), The Baltimore Watercolor Society, and the Washington Society of Landscape Painters, and a juried member of OPA (Oil Painters of America). Watch “Virginia Bluebells” Get Painted! Notes For Painting On-Location: Plein-air painting is a fantastic way to involve all your senses in creating a painting. The special sense of place and unique lighting of that one singular moment hurry the art along in a frenzy of creativity that cannot be duplicated in the studio. Photos shot on location so often disappoint and are always second-best to painting on-site. The human eye sees many more colors and subtleties that no camera can capture. My painting was created entirely on location. The reference photos you see here (above) were taken right after the art was painted. This painting was sold to a passerby that saw me create it. Palette Notes: My palette has Grumbacher Max Oils in: Ultramarine Blue, Cobalt blue, Cerulean blue, Thio Violet, Barium Yellow Pale, Cadmium Yellow Medium, Burnt Sienna, Napthal (Quinacridone) Red, Madder (Duo oils) and Thalo Green. My Titanium White is from Holbien’s Duo Oil line (I’ve found it creamier than the Max white and it’s easier to open/close the tube). Sometimes I add different colors, but this is a good array of paints. I do not thin with a medium as these are water-mixable oils. Preliminary drawing strokes and first swipes of color use some water for a thinner mix. Top layers of paint are always painted full-strength with no thinning. 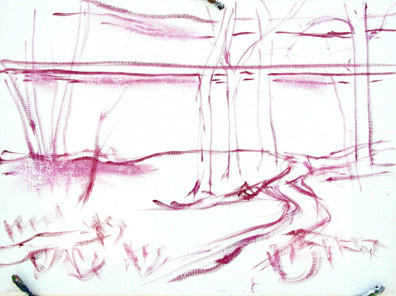 1: First Steps – Create A Rough Drawing. The drawing was done in one of my favorite colors for landscapes: Thio Violet, made by Grumbacher. 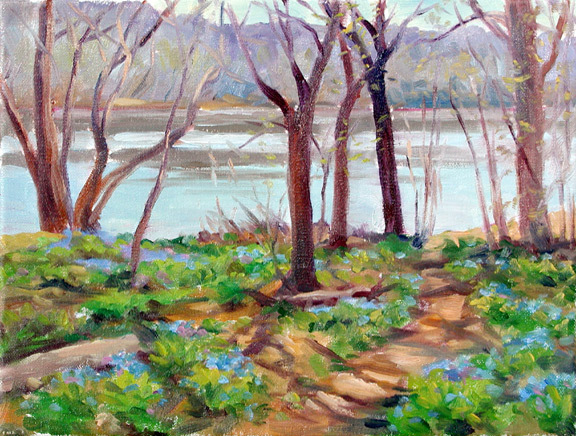 Usually I use a burnt sienna color for the initial drawing, but I wanted to capture the soft shimmering spring light I saw… and the focus of the artwork was going to be the fabulous pink to purple-blue of the Virginia bluebell wildflowers. I start applying large areas of color. The trees will be the darkest darks, but I keep them warm with my reds and Burnt Sienna. Ultramarine Blue or a tiny dab of white is added to darken and/or dull some areas. The sky, river and background land mass are worked together. I keep these areas light to contrast with the trees. Here I work the foreground, watching my values and keeping my color choices more vibrant near the viewer. 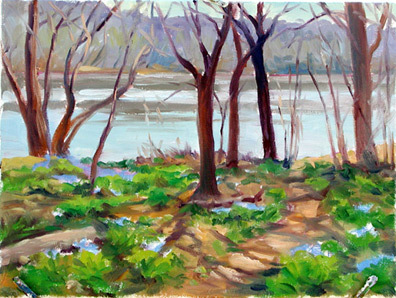 The bluebells were just coming into bloom and only a few were open, but I painted them as if they were at peak bloom, and as a haze of iridescent purple-blue (they are an incredible sight in full bloom). All the canvas has been covered and I start to adjust colors and shapes. 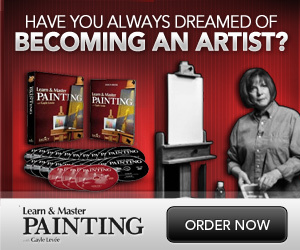 The paint remains wet during the painting session and so can be manipulated easily. I keep adjusting colors and shapes paying attention to the areas of interest along the path… branch shadows and plant clumps. Sapplings are added with the brown tree color mix and glide over the background paint, but also mix slightly with the wet paint. This creates a feeling of atmosphere. The last touches of paint are dabs of yellow and green to suggest the first tiny buds on the branches as they pop open in the warm spring sunshine. Wishing you every success and blessing as you continue to create beautiful paintings and great instructional content for others.